I've been home from the NCCE-Northwest Council for Computer Education conference for two weeks, and my head is still spinning with all of the educational awesomeness I encountered there. It was my first time at a big education conference, and I did my best to take it all in. I attended 14 sessions and workshops and kept up with countless more via Twitter. I walked every aisle of the exhibit hall, and spent all of my free time connecting with inspiring educators from around the country. Collaboration is the big idea in education right now. I learned strategies for managing collaborative work in Google Drive including having students experiment with collaborative documents by starting with a spreadsheet with their own assigned rows (thanks Nikki Robertson). Cheryl Steighner hosted a terrific session about Google in elementary schools. One of her ideas is to have a collaborative story that students can add to over time. She has one story that students have continued even two years after leaving her classroom! Throughout my time in Portland, I heard about countless apps, websites, and tools that I will be exploring for months to come. As great as the official sessions and workshops were, the best part of attending NCCE was connecting with other educators. There were quite a few sessions about how important it is to build a personal learning network (PLN) through Twitter or another social learning platform. I am a full-fledged Twitter evangelist, and my time at NCCE proved why. Everywhere I went, I ran into people I already knew. We were able to jump in and discuss because we already knew each other's backgrounds. 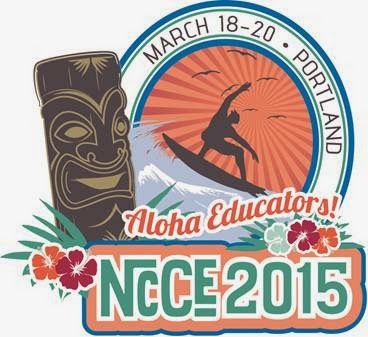 I added many more educators to my PLN so I could continue to learn from them after NCCE. One highlight of connecting at NCCE was Wednesday's #IDedchat. We met at a swanky, 30th story bar in downtown Portland to discuss professional development. It was a little strange staring at our phones to chat online when we were in such a beautiful place with great company, but being together created a more festive atmosphere for the chat. Plus, most of us arrived early to share dinner and chat. I also got to have a wonderful lunch with Cheryl Steighner to discuss tubas and elementary education, and I spent a night on the town with some of my colleagues from Coeur d'Alene (Kelli Ogle and Kiersten Kerr are the only ones on Twitter) and Nikki Robertson from Alabama. I also got to chat with one of the most inspiring bloggers I know, Steve Wyborney, in the exhibit hall. Those informal learning moments were the best of the conference!